If you’re looking to push your SMS marketing campaigns out to a bigger audience or simply want to build your database, take a look at these easy ways to get customers opting in using SMS short codes and keywords. Creating a successful SMS marketing or alerts campaign is similar to building a house. Before you lay a single brick or kit the house out with a fancy 4K television, you have to build a solid foundation. In business text messaging terms, this starts with using SMS short codes and keywords to form a quality opt-in list. It’s worked for thousands of businesses around the country. In fact, in our latest white paper, Mobile marketing for small and medium size businesses, we highlighted that 91% of consumers like to be contacted by businesses via SMS. The latest total opt-in figures support this. By the end of 2016, 33.67 million UK mobile users had opted in to receive business SMS. By 2020, this figure is set to reach 48.65 million – making text messaging the UK’s fastest growing marketing channel. We all love winning things. So, if you’re looking to build a list quickly, a short number with a keyword ‘WIN’ would work a treat. Just make sure that you invest in a prize worth winning. Another thing you need to consider is what keyword you choose to go with. If you’re a local pub and you’re getting entrants to text a keyword they found on a beer mat, you might want to consider how simple the word is. Especially if the punter has had a skinful! Don’t pick a word that gets auto-corrected all the time. Busy commuters looking for a quick caffeine fix at a coffee shop don’t have the time to re-enter a competition (despite how amazing the prize is). You should also make your SMS keyword easy to spell and phonetic. If you’re spending money on including this keyword in a radio jingle, you don’t want to miss out on potential opt-ins because your baby shop picked the keyword ‘crèche’! We all know the old phrase, curiosity killed the cat. The same goes for SMS opt-ins. You don’t need to tell customers every detail on what you’re going to send them. Keep your description brief. For example: leading property company, Strutt and Parker, needed to generate leads and raise awareness of a new development to passing motorists. 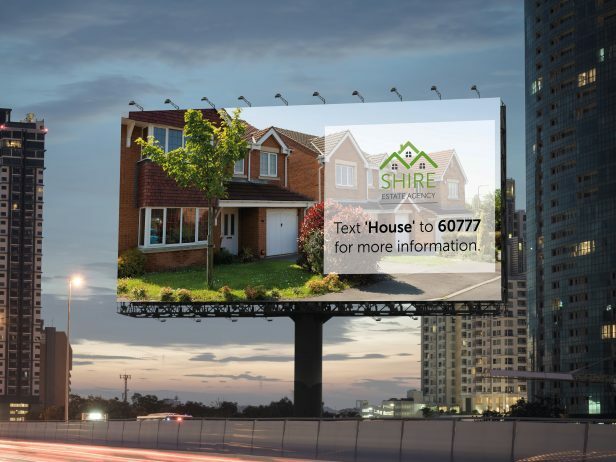 They placed the keyword ‘House’ and the short number 60777 on an outdoor billboard advertisement just off the M62. House hunters didn’t have the time to read more about how many beds there are or what the going rate is for one of them. Especially when they were doing 70 mph! They needed a simple keyword and a short number for them to easily remember. As a direct result, the short code generated a huge number of enquiries, with a large proportion of these leads eventually being converted. Strutt and Parker were then able to send further property updates down the line. Even Donald Trump used short codes and the keyword ‘TRUMP’ in his election campaign, with no extra info included. And we all know how that ended up! If you don’t have the marketing budget to splash out on advertising on motorway billboards or local television, don’t fear. 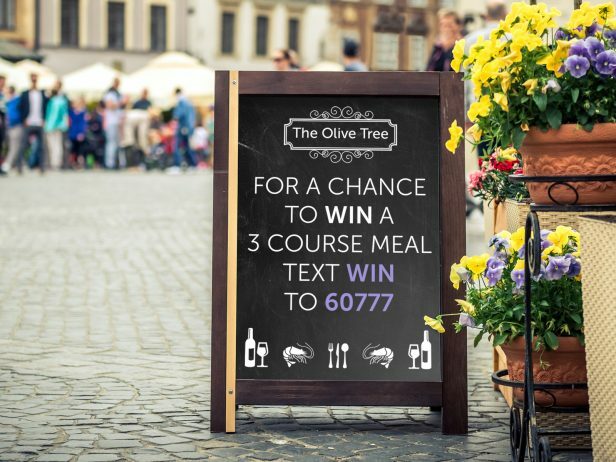 Many businesses, such as pubs or restaurants, simply use a stand or chalkboard to advertise their SMS short code and keyword. Just make sure you pop it outside where pedestrians can see it. Building a top text messaging database can also be achieved by improving the customer experience. Allow me to explain: many businesses use an incentive to get customers to use their SMS short code and keyword. However, offering them information in exchange for their number is also a tried and tested formula to build a list. Bus operators, Southdown PSV Ltd, are a great example of this. Their telephones were constantly ringing when a bus was delayed, subsequently wasting valuable staff resource. In light of this, Southdown PSV purchased the keyword ‘BUS’ on 60777 and created a number of sub keywords specifically for each bus service. 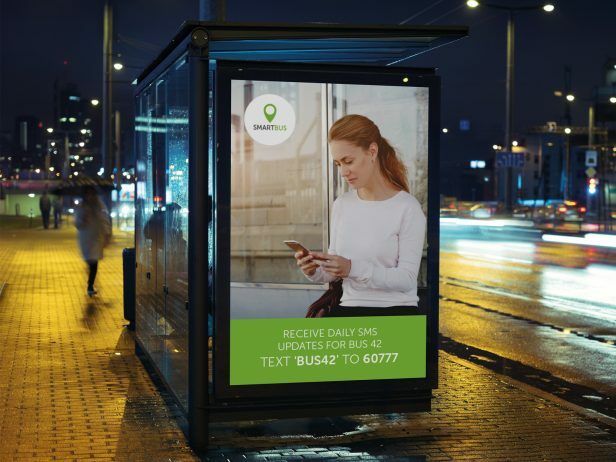 They then advertised it on the relevant buses and if a passenger text, they’d instantly be signed up to receive alerts and notifications about any travel disruptions. Text messaging gave the team at Southdown PSV a lot more time to focus on different areas of their business. But more importantly, it improved the customer experience. Although some of these businesses spent money to get their keywords seen by thousands of people, you can still create a top-quality SMS database with little or no budget. At the end of the day, it all boils down to one question: are you offering a customer a real reason to pass their mobile details over? 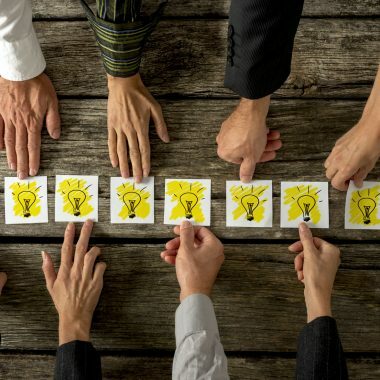 Customers are savvy, you need to incentivise, interact and inform. Offer real value and you’ll have hundreds texting in before you know it. Sign up with Textlocal today and we’ll give you a free keyword to help you get started.